Hello everyone. Finally I get back to what I like doing the most, writing about what I like and what I like to eat. June was moving time , I have now settled well in the new house and trying to make it home.. It was my elder daughter's birthday yesterday She had invited a few friends for lunch so the menu was set as Lasagna, Apple truffle and Banana cake. I was apprehensive about try Lasagna earlier . But we had had awesome lasagna at a friends place so I tried it again with renewed enthusiasm and with Shobha's recipe which seemed very simple. So the lunch yesterday was Vegetable lasagna and Apple truffle (if it can be called so). Lasagna it was yummy ,thanks again to Shobha .The only piece I had was the spoon I had before serving (for taste)it to the girls .The empty bowl was evidence enough that it was finger licking good in their words. Apple Truffle needs more improvement , though girls thought it was good. I might make it again before posting the recipe. Banana cake was made by another friend of mine ,Thanks Sheetal it was great and I will post the recipe soon. Lasagna is a classic Italian dish with alternate layers of pasta , cheese, sauce and other ingredients... like vegetables or meat. Lasagna are the sheets of pasta used in the dish known as Lasagne in UK. I won't say mine is the best recipe but this is one of the simplest and easy to make recipe. This is how I prepared it . I am writing the ingredients with the method so that it is easy to follow. This dish is basically made of layers and then baked in the oven. In a deep bottom pan or skillet add two spoons of olive oil. when it is hot add the onions and capsicum/bell peppers.Saute for several minutes and add the rest of the vegetables.Add the other vegetables and let them cook with little salt and pepper. When the vegetables are done add chopped tomatoes with two spoons of butter. The tomatoes grow soft very quickly then add the tomato sauce and tomato puree with half a cup of butter and half cup of cheese. Bring the sauce to a boil and add two cups of water. Reduce the heat and let the sauce simmer and adjust the seasonings while you prepare the pasta for layering. 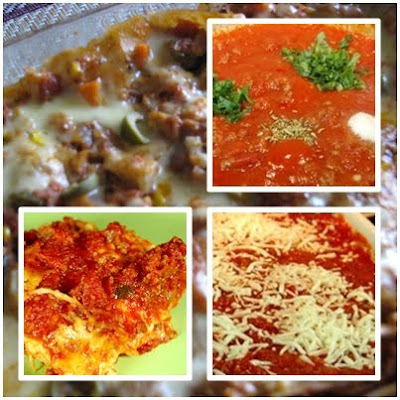 I have used the the very thin Agnesi Lasagna sheets so there is no need to boil or soak them in hot water. Take a oven proof pan ( I used a 6 x 9) Borosil pan.Smear a little of butter all over the pan. Spread one cup of sauce as the first layer.Lay 4 pasta sheets on the layer of sauce. Spread a layer of grated cheese.Now pour another layer of Sauce, place 4 sheets of pasta on the sauce and spread the cheese. Pour the remaining sauce on top . sprinkle the remaining cheese and olives on the top. Cover the bowl with foil.Allow some space between foil and layers for the boiling sauce. (this can be frozen and baked another day too) . Bake in a preheated for 25 minutes at 180 C .Remove the foil and bake uncovered for another 10 minutes. Remove from oven and allow to cool .Serve hot. Let me know how yours was if and when you try this out.